This is an amazing rhyme book! Both of our girls love this book because it is fun and has very colorful cartoons. It is actually three books in one. It is the rhyme book for children, but it also includes a repeat of the entire book in black and white, to serve as a coloring book. I don't allow our girls to color in the book but I do copy the pages from time to time and allow them to color them then. Also in the back of this book is a complete adult section that explains each rhyme. It gives us hints regarding how to engage our children while reading the book to them. Our girls' favorite part of this book is at the very end where all the names are written in the "Lamb's Book of Life". Both of our girls always say, "I see my name. I see nana's name. I see daddy's name and mommy's name", etc. If you are a Christian that believes in biblical creation and you have young children, then you really should add this incredible book to your library. It is a rare find in this category of books. Find the best price for A is for Adam. 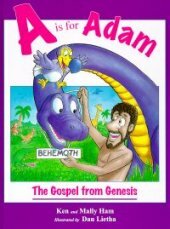 This is the best children's bible I have ever seen, period! We have about 4 or 5 children's bibles in our library but none of them compare to this one. The illustrations are outstanding but best of all are the rhymes. Each biblical account is told in rhyme, which small children love. There are some nights when I ask our girls, "Which books do you want to read tonight?" They will pick this bible and have me read through it story after story after story. I guarantee that your children will love it also and they will learn from it. Find the best price for the Rhyme Bible. Dora is the queen's chambermaid. Dora never does what she is told, now or right away. She always takes a long time to finish a task. She was suppose to make the queen's bed but she kept dawdling. James warned her that the queen was coming but she didn't listen. Then it was too late. As Dora tries to hide when the queen enters her bedroom, Dora makes a complete mess of the queen's bedroom. The Queen asks for Dora to be removed, but the next day, Dora learns to do what she is told. This is a book about obedience and both of my girls love this book. When my oldest Kasi was 3 years old, I must have read this book 100 nights in a row. She would always pick this book. It has some neat pictures in it as well, such as the spiral stairsteps leading up to the queen's bedroom in the castle. Whenever we landed on that page, Kasi would take her finger and do spiral loops, as she imagined Dora walking up those stairs. What else can I say, this books is awsome for little girls and we as parents can't go wrong with books that encourage obedience. 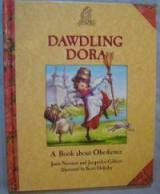 Find the best price for Dawdling Dora. If you have never read a Lois Lenski book to your children, you are missing out. You are missing out in seeing your little one's faces light up with joy. 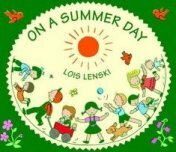 Lois Lenski is a classic children's author from the 1940's. Her books have been out of print for decades but recently, they have begun to bring them back. This particular book about spring is a pocket sized/hard bound picture book that is full of color. It has simple rhymes about spring and playing outside. It is a true delight. “The charm and usefulness of these books hasn’t diminished at all since they were first published in the 40’s.” - Jacksonville Florida Times-Union Find the best price for Spring Is Here. This is another great Lenski book from the 1940's. In this book, the brother and sister play together all day long on a summer day. They pretend to be on a train, in school, at church, etc. Sister pretends to be the teacher and brother is the student. Then brother pretends to be the pastor at church with sister in the congregation. It is a really neat book because it allows children to see how they can be creative and use their imaginations when they play. The pictures in the book show the children making things out of ordinary household items. As an example, the train they made from boxes. For today's TV/video game kids, a book like this is a real blessing. I know that when I read this book to my girls, I always wish that times were simple again like they were in the 40's! One last thing, there is also a catchy little song that rhymes included in the front of the book. Find the best price for On A Summer Day. Here is another superb Lois Lenski book that we own. This book has what so many children's books today are missing and that is a traditional family that spends time together. They eat dinner together, have fun together, tend the garden together, go to church together, etc. The children help around the house. They are part of the team. Also Papa Small leaves for work each day and Mama Small stays home and takes care of the children and the house. That is a rare site today isn't it? However; Papa Small also helps around the house and gives Mama Small time to rest. Papa Small gets time to rest as well. The book, as every Lenski book that our family has read, is a true joy. Get them in color while you can. The originals were black and white only but reprints are in full color. Although not owned by our family yet, we have read some other Lois Lenski books and like I've said, they are all very good. Some other titles include: Cowboy Small, The Little Fire Engine, Policeman Small, Little Airplane, and Little Sailboat. 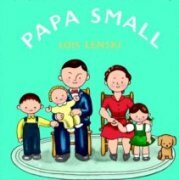 Find the best price for Papa Small. This book is very well done and it is unlike any princess story you will ever read to your daughters or sons again. Why you ask? Because it teaches a valuable lesson of purity and carefully selecting the proper husband. What book does this nowadays and is also an entertaining, well written story at the same time? Well, this one does and it is put togther in such a way that young children will grasp the teaching and understand it. They will see how the Princess denies the rich suitor, the charming suitor, the handsome suitor, the strong suitor, and even the romantic suitor. The Princess eventually chooses the young man that admires her character. He also has a servant's heart. He is definitly not like the prince of Snow White or other such stories. What I also like about this book is the honor that is shown within the family. The King and Queen teach their daughter very well and she honors them. They honor her too. Then when she does choose her husband, we find out that his parents also taught him the same valueable lessons, as he was saving himself for marriage as well. I guess In an age where marriage is taken so lightly, if at all, a book like this is a real blessing. Now my oldest is only five but I believe this book is good for much older kids as well. 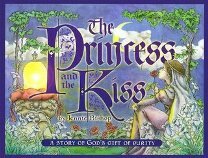 Find the best price for The Princess and the Kiss. This is the absolute perfect book for reading to your toddlers before going to bed. It is another American classic from the 1940's. I do not remember the book from my childhood days but I do have a vague memory of "the cow jumping over the moon", which is included in the book. When I first started reading this book to Kasi when she was one, I thought to myself, what a strange book. It does have some very awkward sayings in it but she just ate it up, so I kept on reading it to her night after night. Eventually, the book really grew on me as well and I began to understand why it is such a classic and best seller. It is very poetic in nature with soft rhymes that lull most any child to sleep when read with the appropriate tone. And the pictures in the book are really fascinating to inspect from page to page, as items move around in the room and the light becomes darker and so on. Probably the best part of this book for children is when the young rabbit says good night to all his familiar objects. This is something children can relate to and love. This book typically sells cheap as a used book and I highly recommend it for your young toddlers. 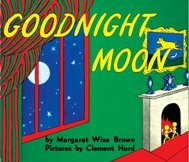 Find the best price for Goodnight Moon. 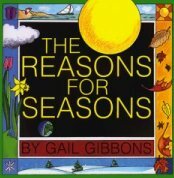 This is a very good book for learning about the seasons. It explains a great deal but in a way in which children can understand. It is probably better suited for older kids but I've been reading it to our girls who are now 3 and 5 and they seem to enjoy the book very much. Find the best price for The Reasons For Seasons. George's mother and father are out and he dreamed that he was small. When he woke up, he found that it was true. His parents left him this huge chore list to do. This list makes up the text of the book and George at 3 inches tall has to complete all the chores. The pictures are outstanding with vivid details in bright colors. There are some very exciting things going on in this book that kids adore, such as George flying a toy airplane and dodging the cat who is clawing at him. At another point in the story, George's brother spots George and the look of his brother's eyes is so funny. My girls always laugh at at this part. The story is a great deal of fun and the illustrations are the best. Another one that is highly recommended. 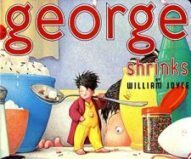 Find the best price for George Shrinks.